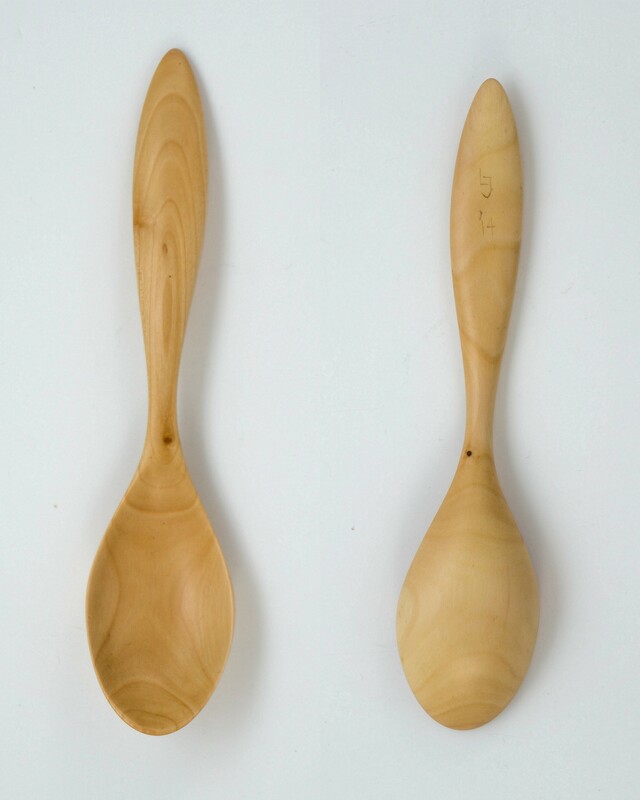 These are some pictures of the spoons I made the last months. 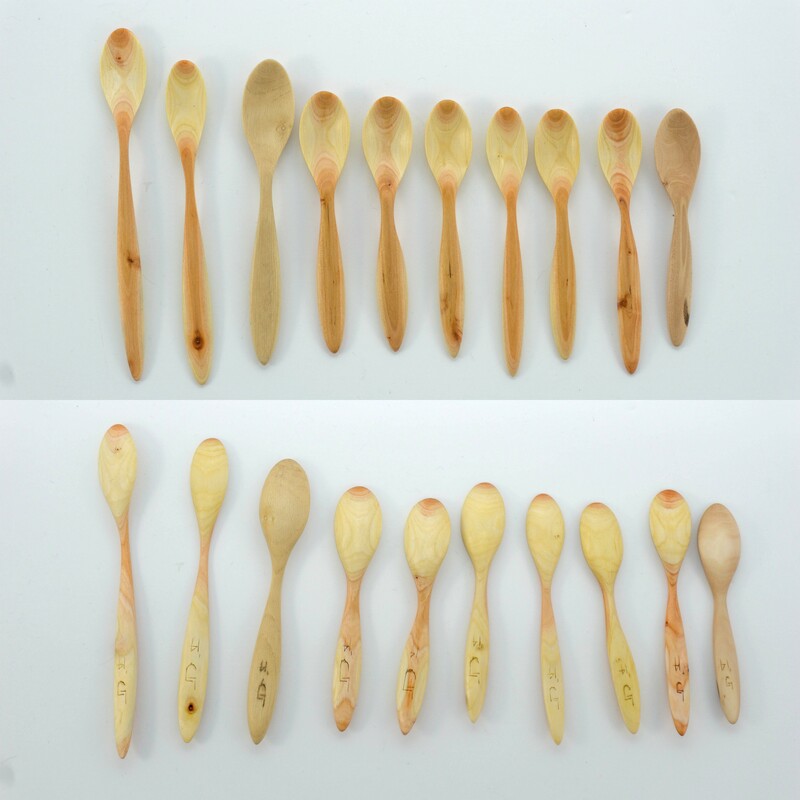 Most have a sanded or scraped finish. 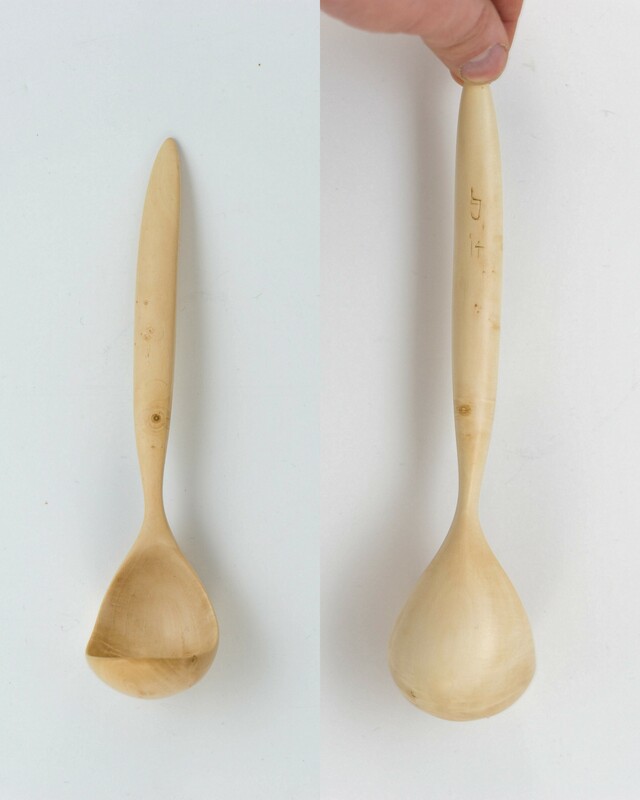 This birch coffee scoop has a bit of burl in the bowl. It holds exactly the same amount as most coffee scoops: 7 grams or 30ml of ground coffee. 19cm long. 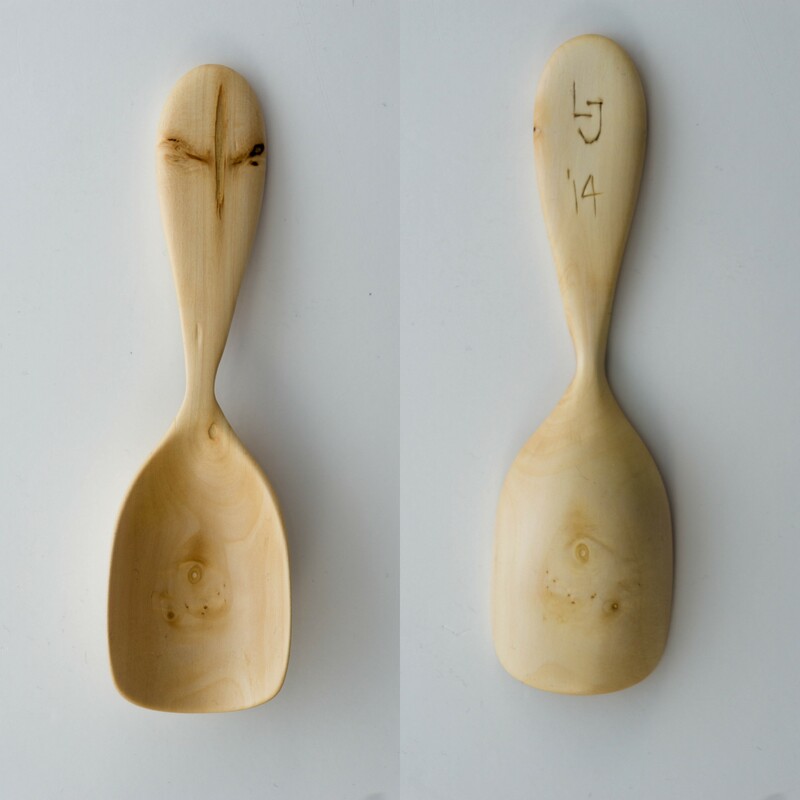 Tulip poplar scoop. 18cm long. 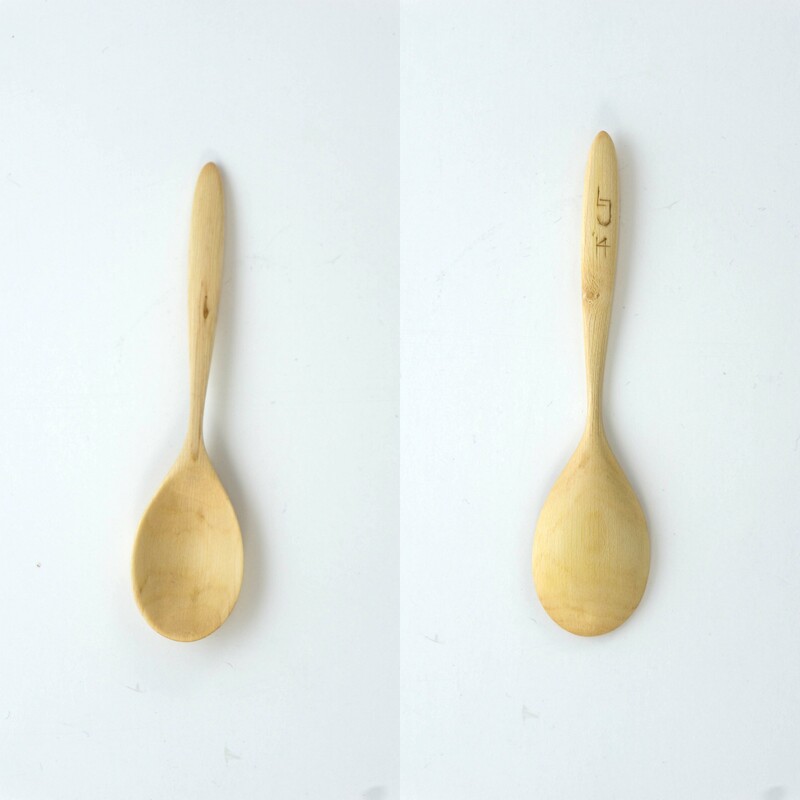 A small field maple (acer campestre) scoop. 13cm long. 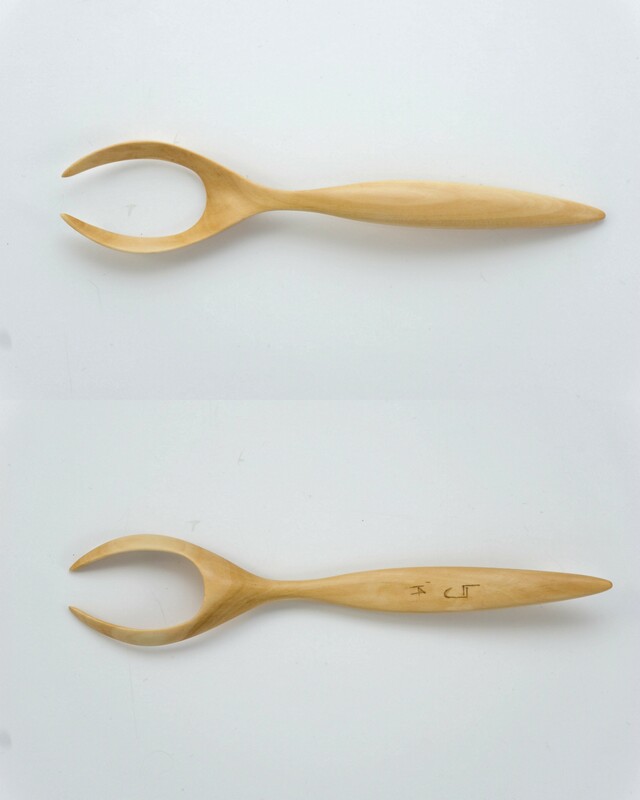 Swedish whitebeam (sorbus intermedia) meat serving fork. 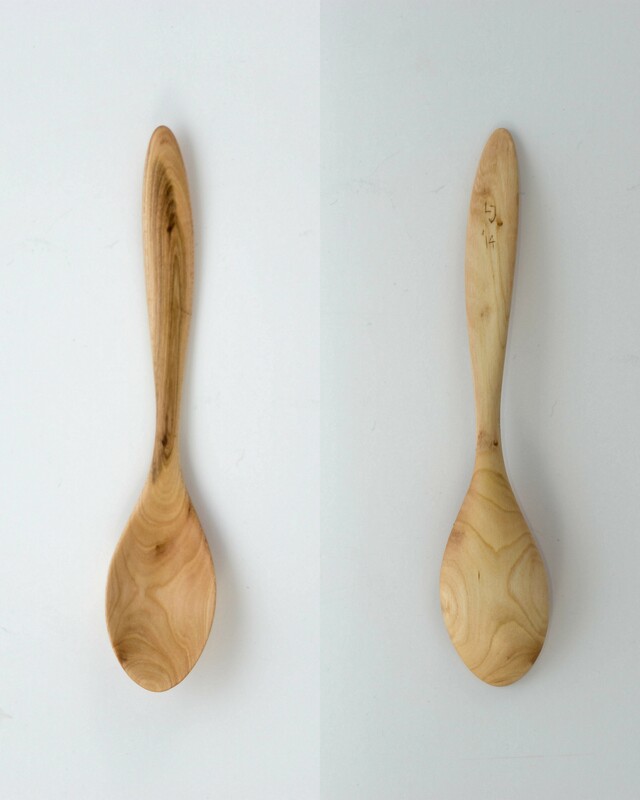 The Swedish Whitebeam is exceptionally flexible and tough, making it perfect for a fork. Most other woods would be far too brittle, causing the teeth to break. 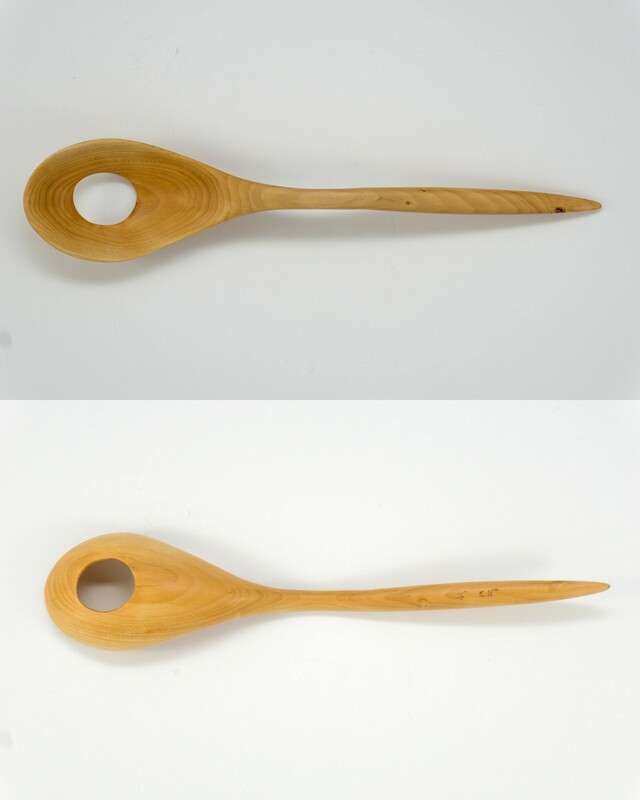 Radially cleft pear eating spoon. 22cm long. A small wild or dog rose (rosa canina) spice scoop. 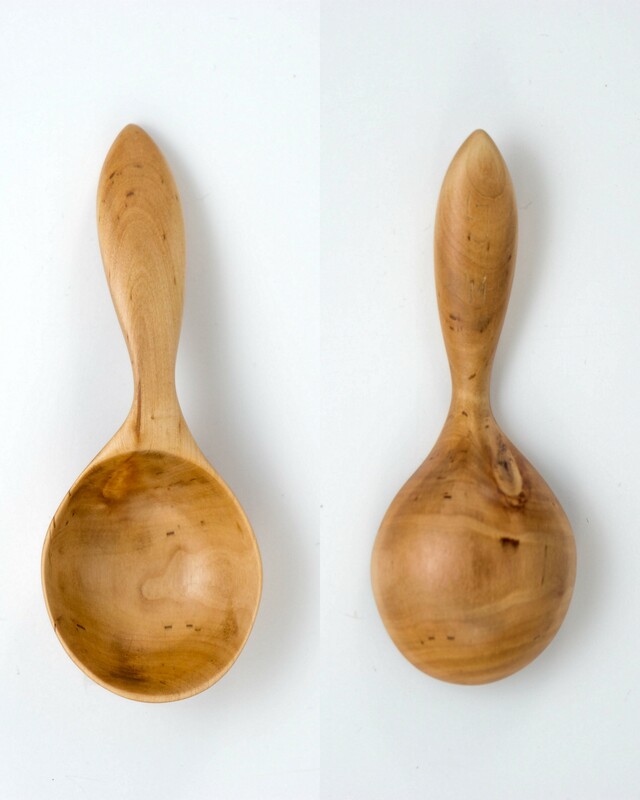 This is really special wood: it rarely grows to a large enough diameter to make spoons out of. It has quite a big pithy core that you have to work around, but the wood itself is dense and tough. It carves beautifully. 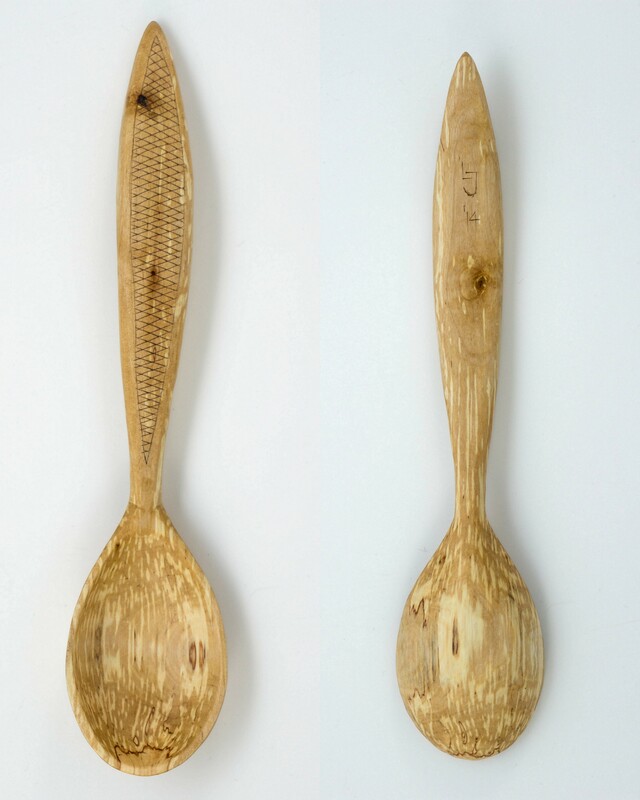 You can find some more spoons from the same wood further down this page. 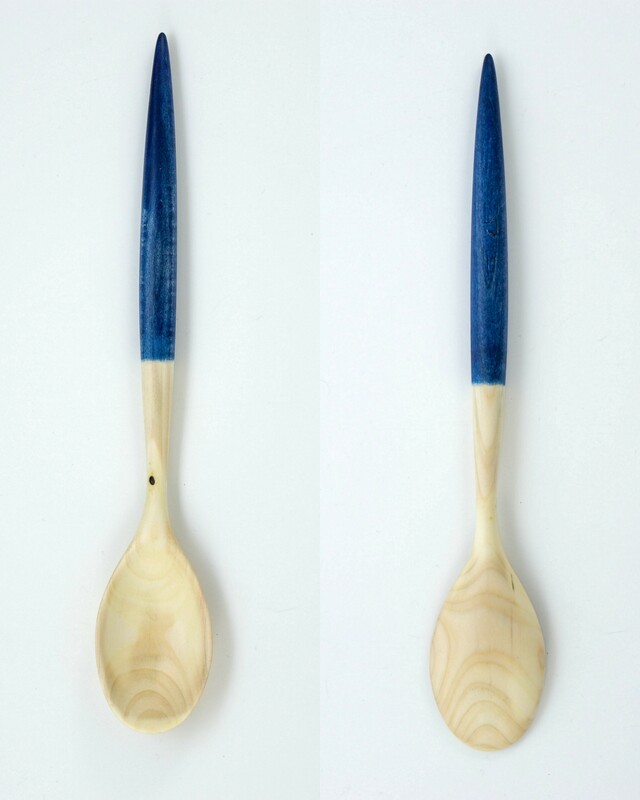 Tulip poplar (liriodendron tulipiferia) cooking spoon, with a blue stained handle. 28cm long. ridiculously large pear scoop. 31cm long. Huge bowl. 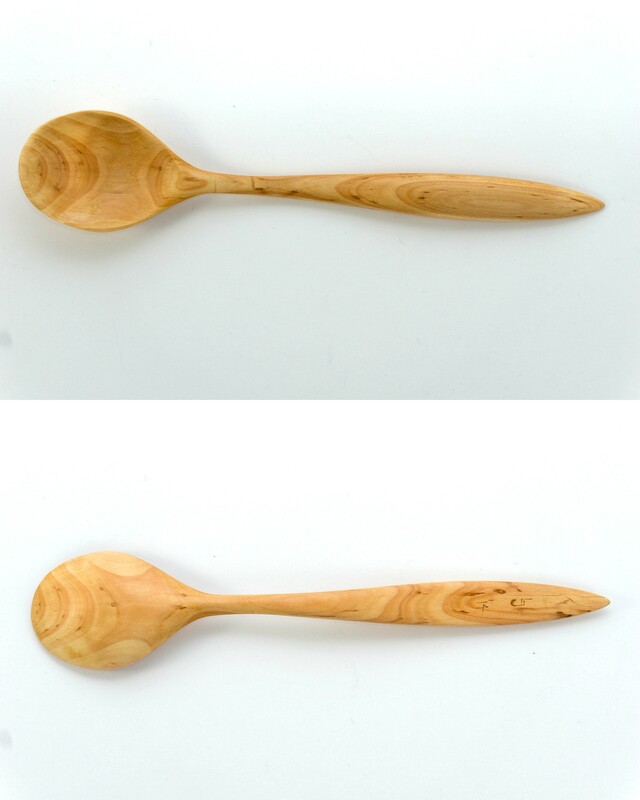 wych elm (ulmus glabra) spoon with kolrosing on the handle. 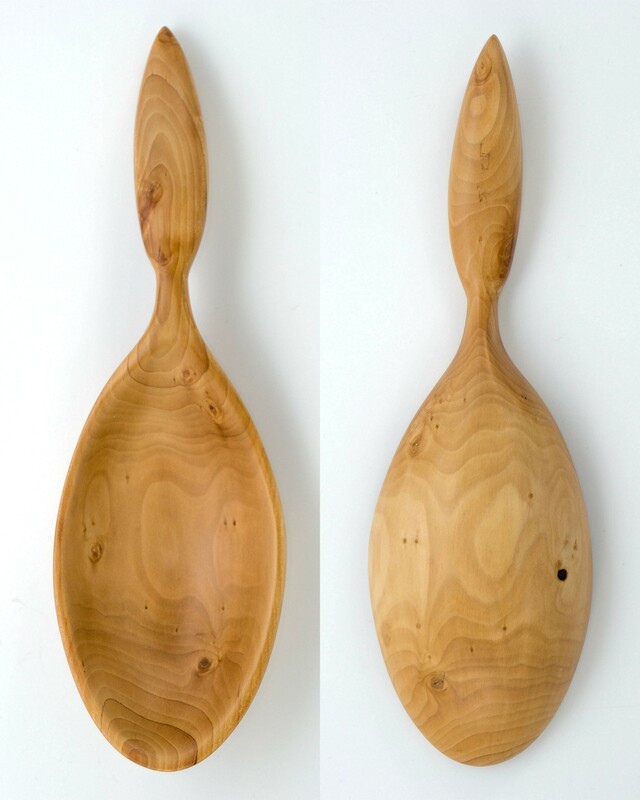 Has a deep, thin and delicate bowl. 22cm long. 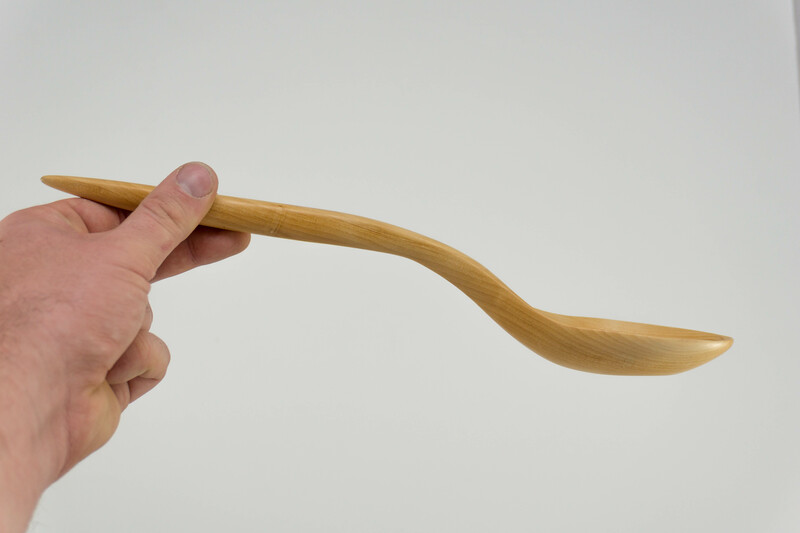 A small spice scoop with kolrosing on the handle. 9cm long. 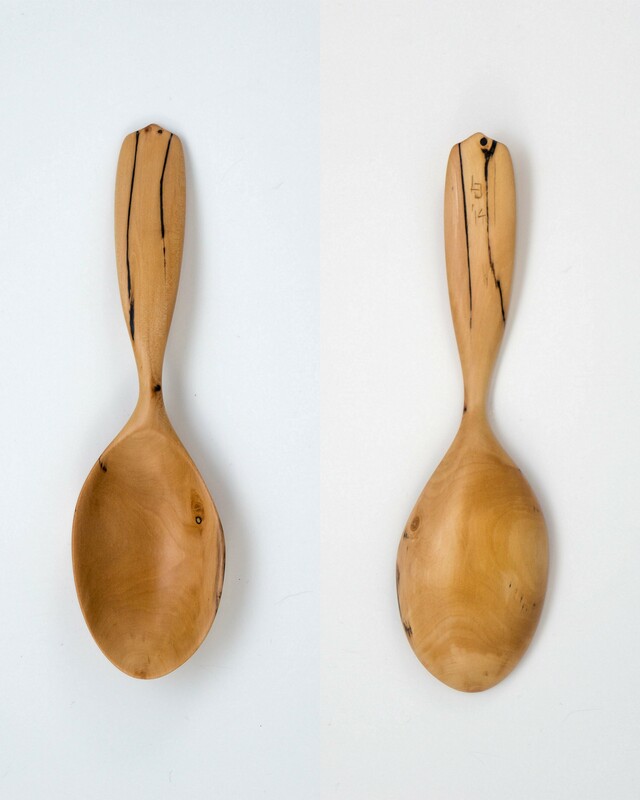 Spalted birch serving spoon. 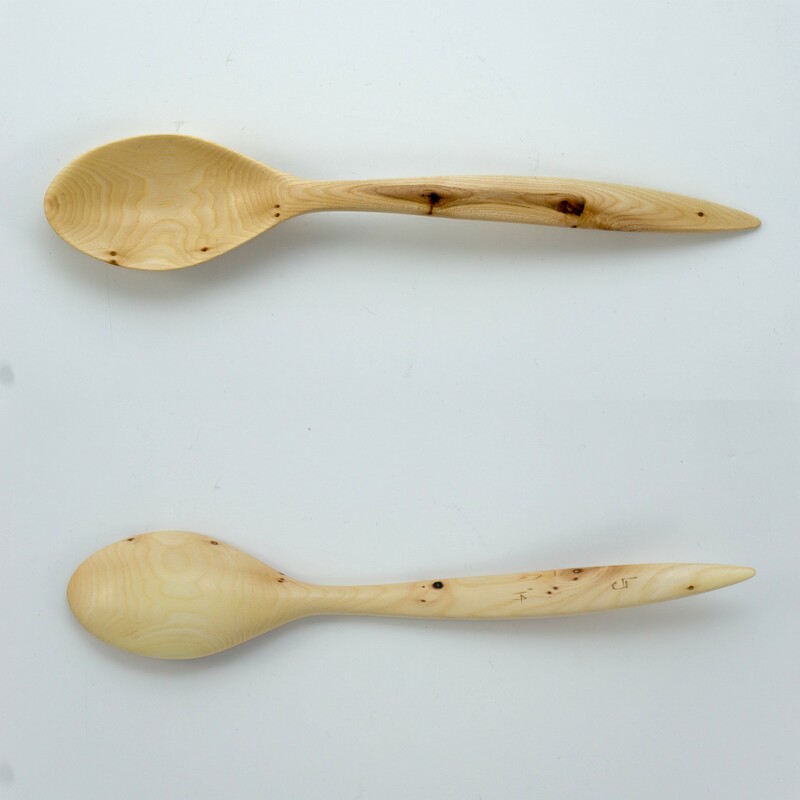 The spalting in these spoons is caused by birch polypore (Piptoporus betulinus) which gives the wood a sweet, apple-like smell when worked fresh. It is completely food safe. 31cm long. 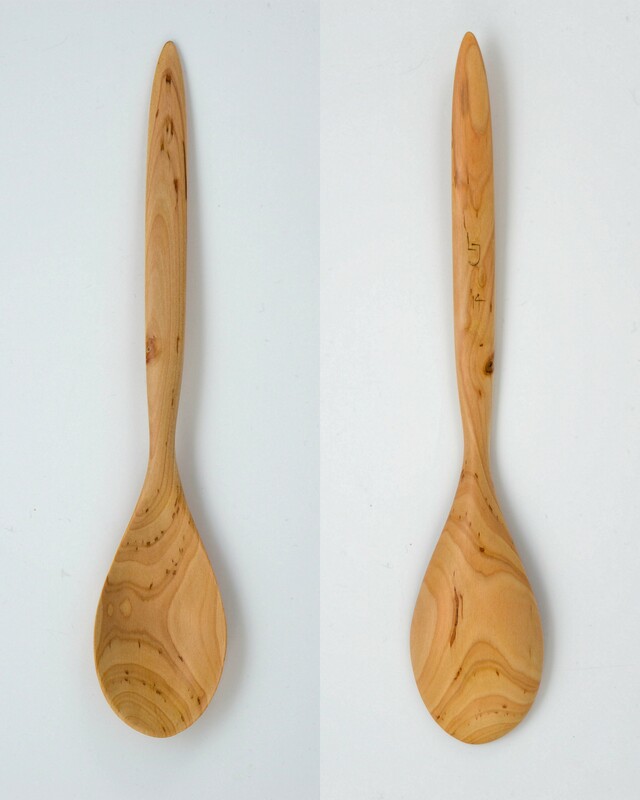 Alder (alnus glutinosa) scoop. 16 cm long. 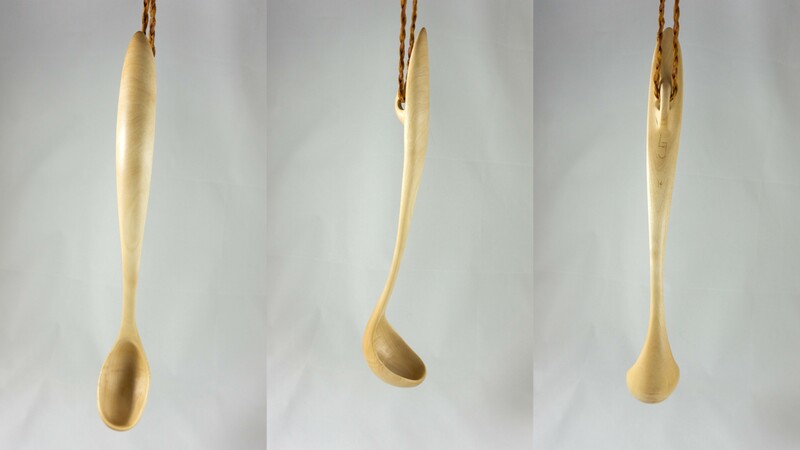 Field maple ladle. 24 cm long. 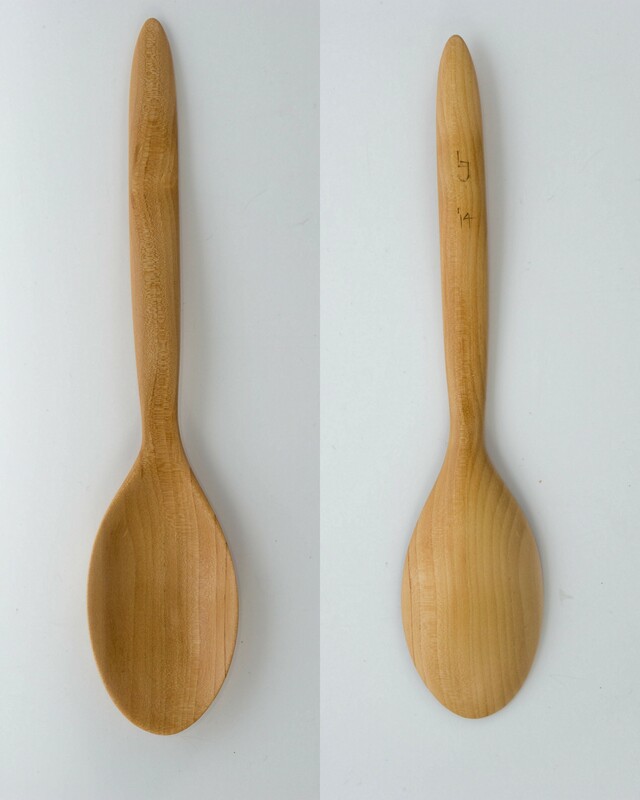 Ash spoon. 16 cm long. 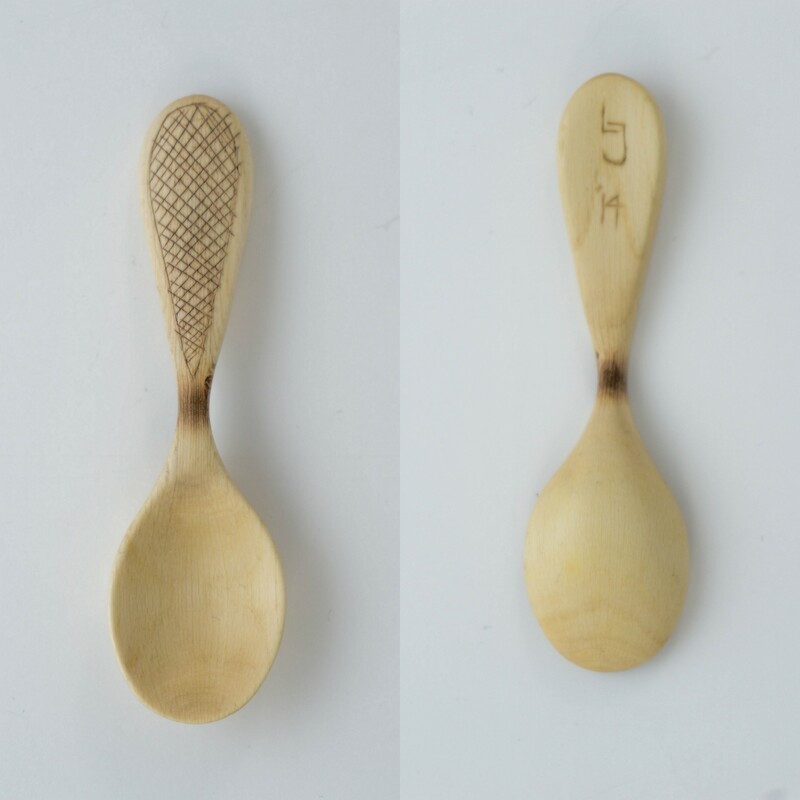 Pear cooking spoon. Has a bit of spalting. 32 cm long. Pear dumpling strainer. 31 cm long. 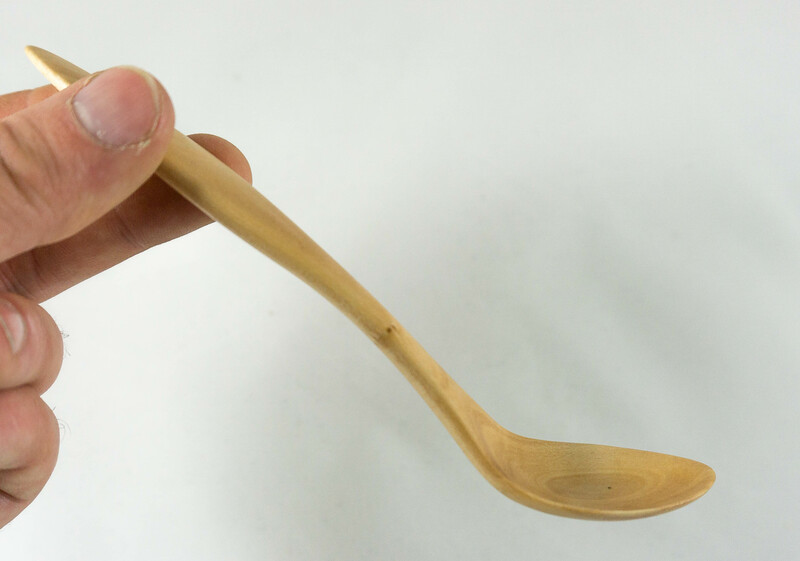 Apple spoon. 23 cm long. 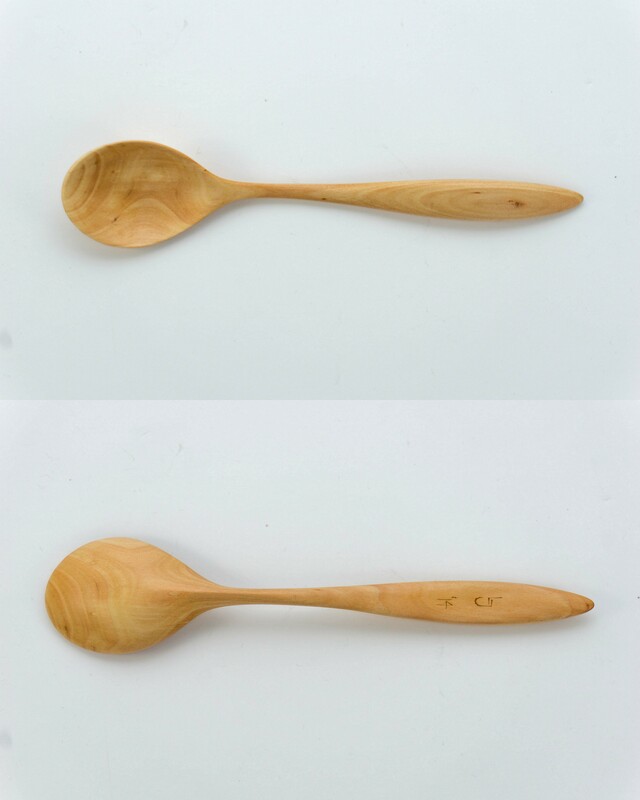 curved cherry (prunus avium) jam spoon. 16 cm long. 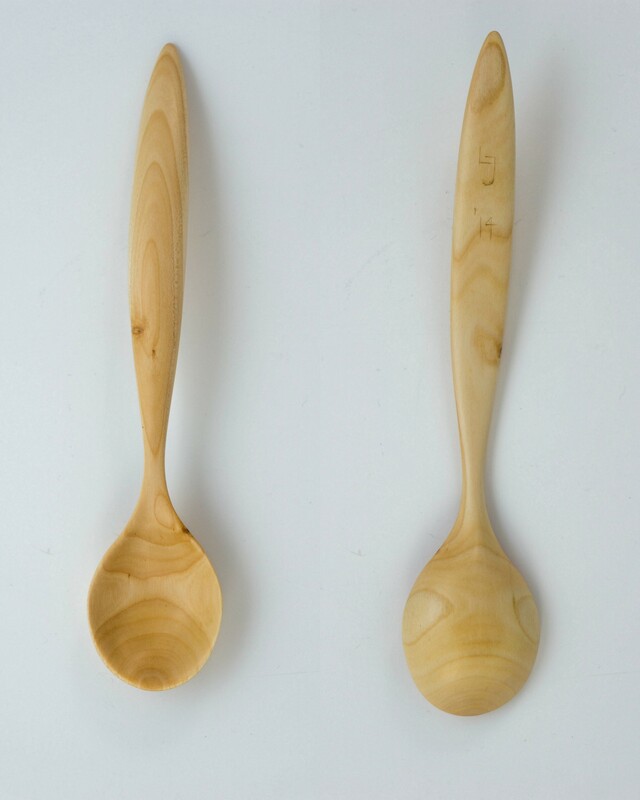 Cherry dessert spoon. Slightly curved. 15 cm long. 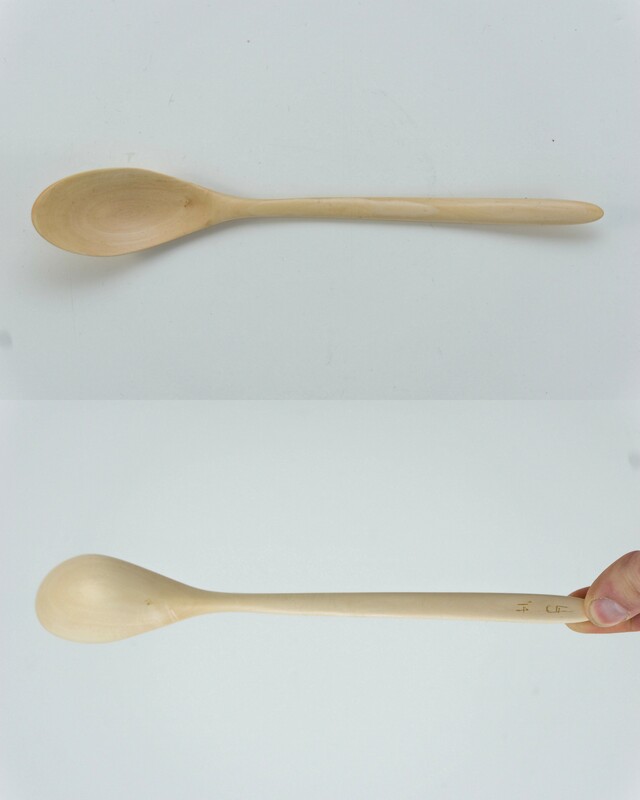 Long cherry teaspoon. 16 cm long. 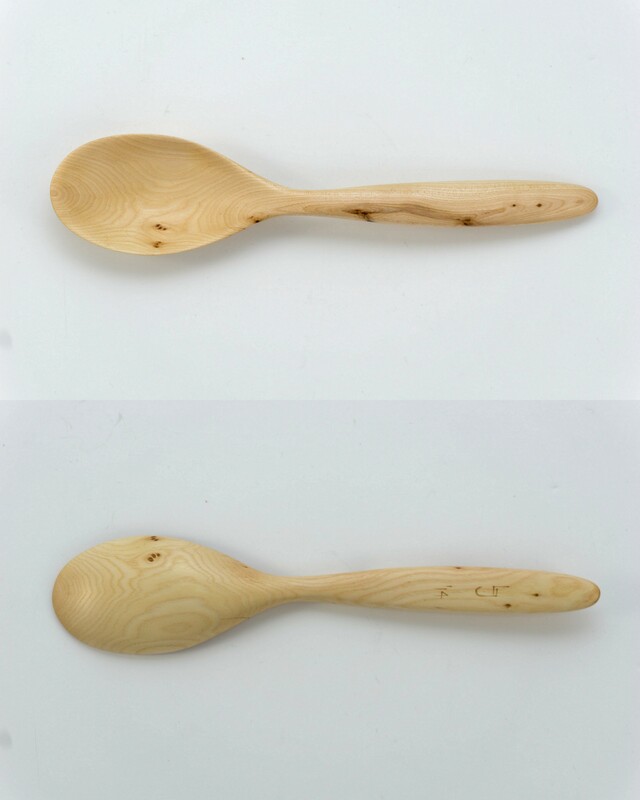 Wych elm serving spoon. 25 cm long. 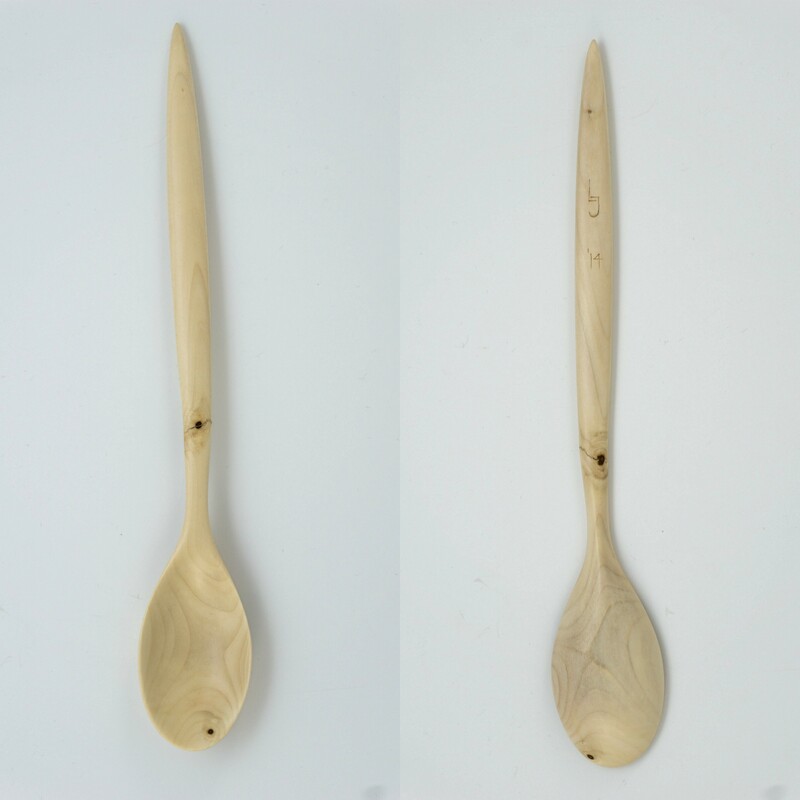 Large alder serving spoon. 31 cm long. 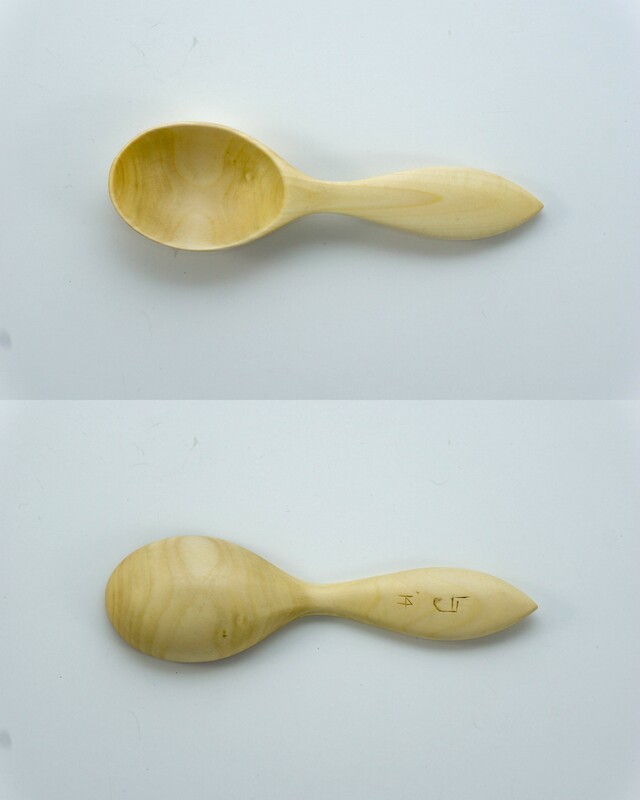 Smaller alder serving spoon. 26 cm long. 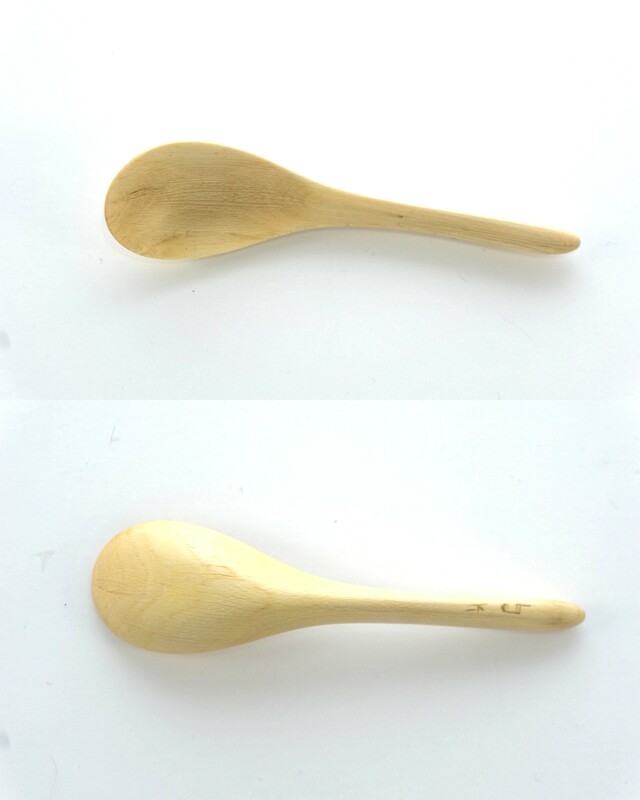 Field maple spoon. 23 cm long. 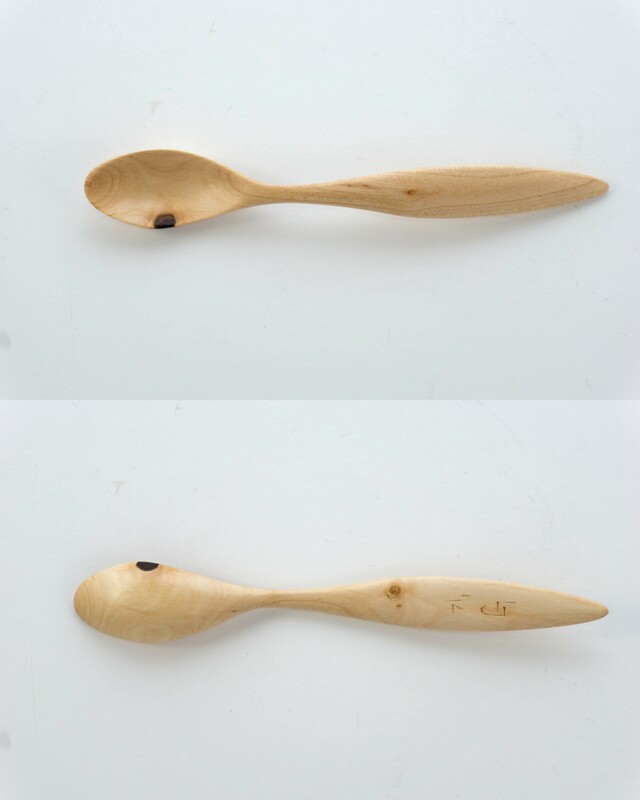 Field maple spoon. Curves upward slightly. 24 cm long. 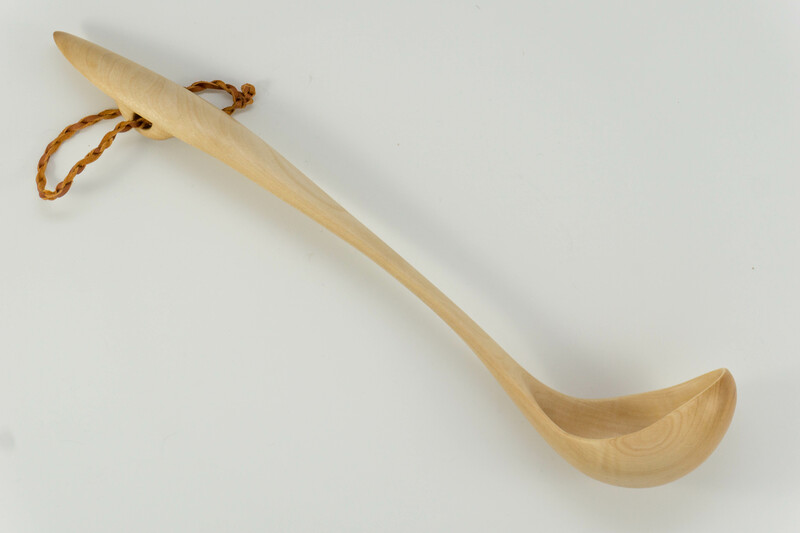 A field maple sauce ladle. 26 cm long. 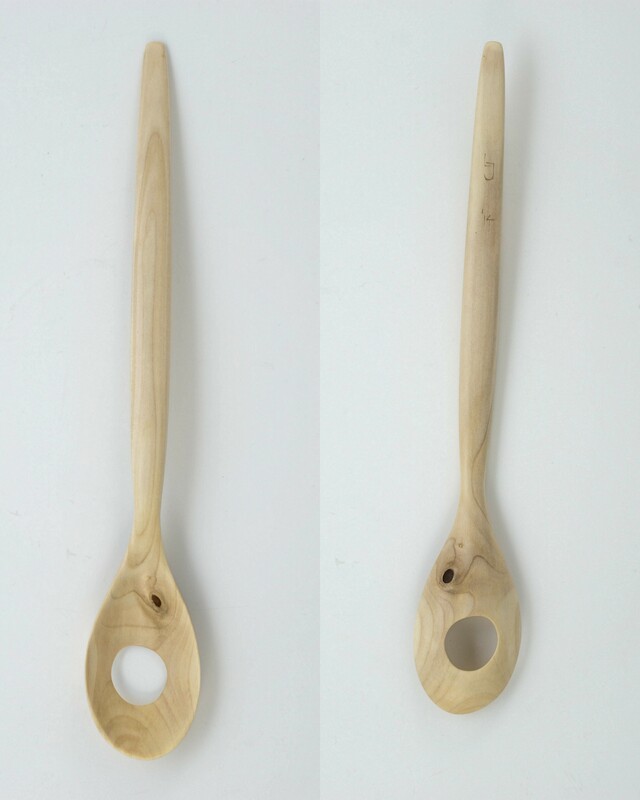 A large birch ladle, 38cm long. 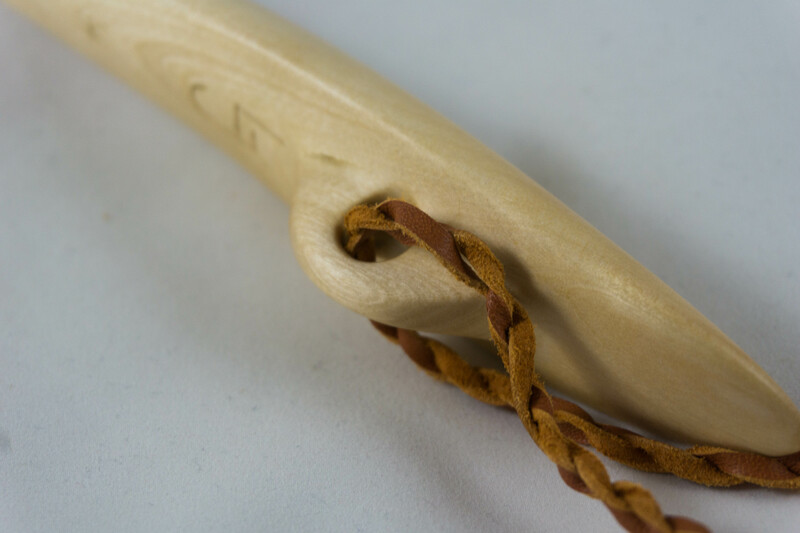 Has a kangaroo leather string. 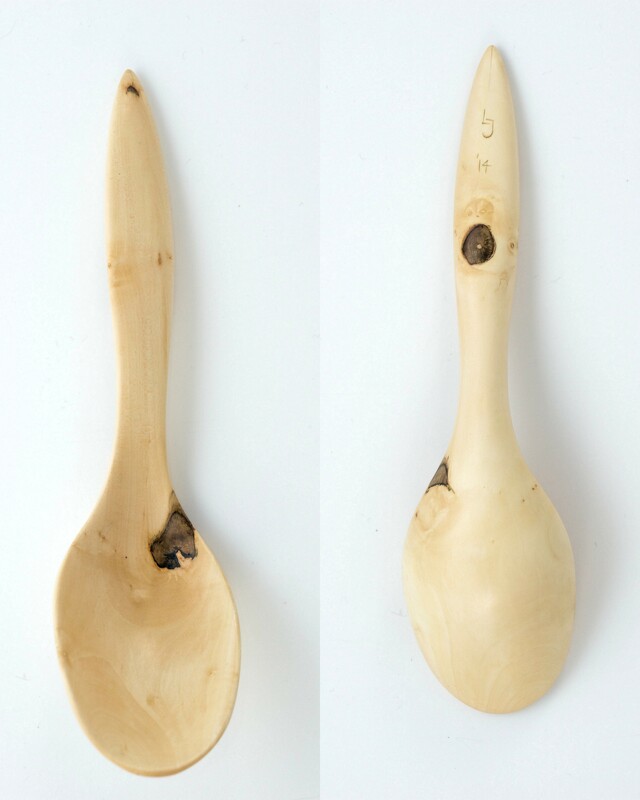 Dog rose (rosa canina) sugar spoon. 12 cm long. 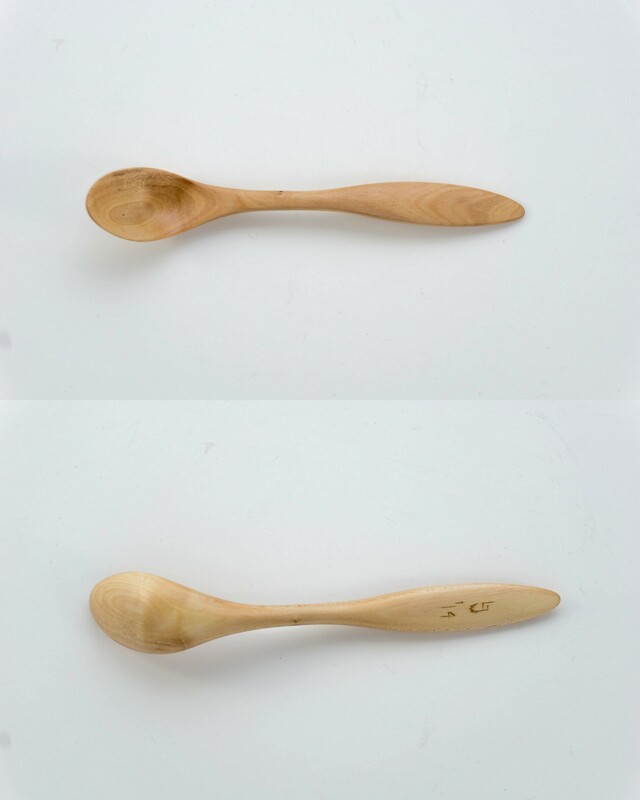 wych elm serving spoon. 26 cm long. 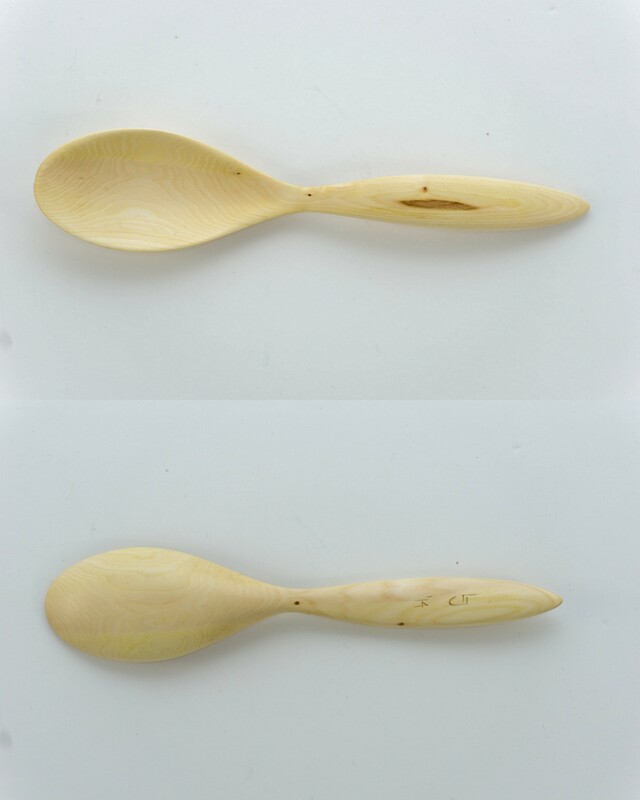 Large tulip poplar cooking spoon. Has a knot and a crack in the neck, but a little bit of CA glue makes sure that doesn’t come apart. 34 cm long. 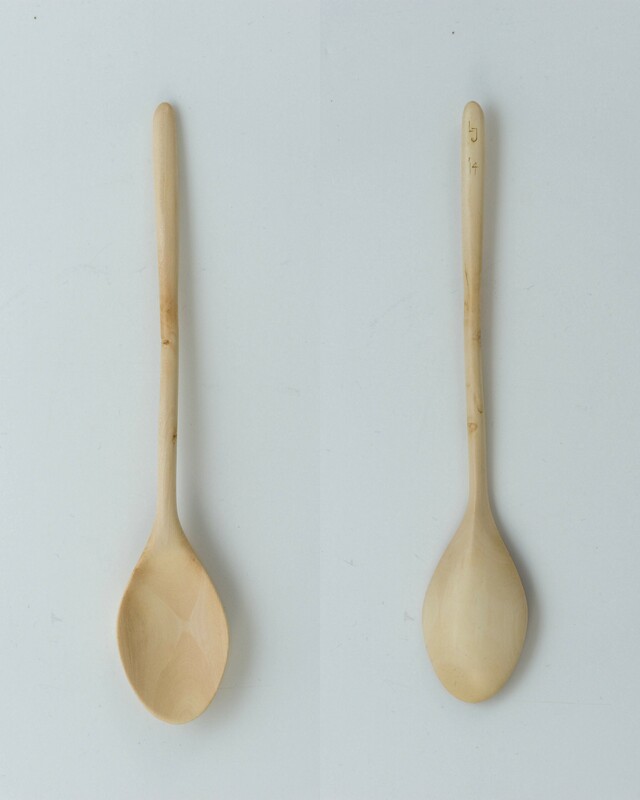 From left to right: black cherry (prunus serotina) teaspoon, 15cm long; black cherry teaspoon, 14cm long; wild rose (rosa canina) teaspoon, 13 cm; 6 black cherry teaspoons; Cherry (prunus avium) teaspoon. 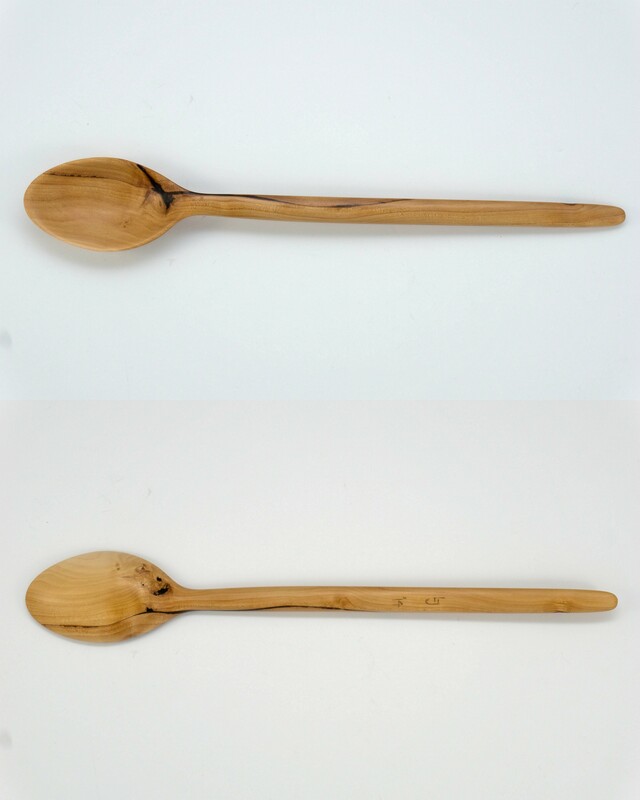 Alder cooking spoon. 28 cm long. 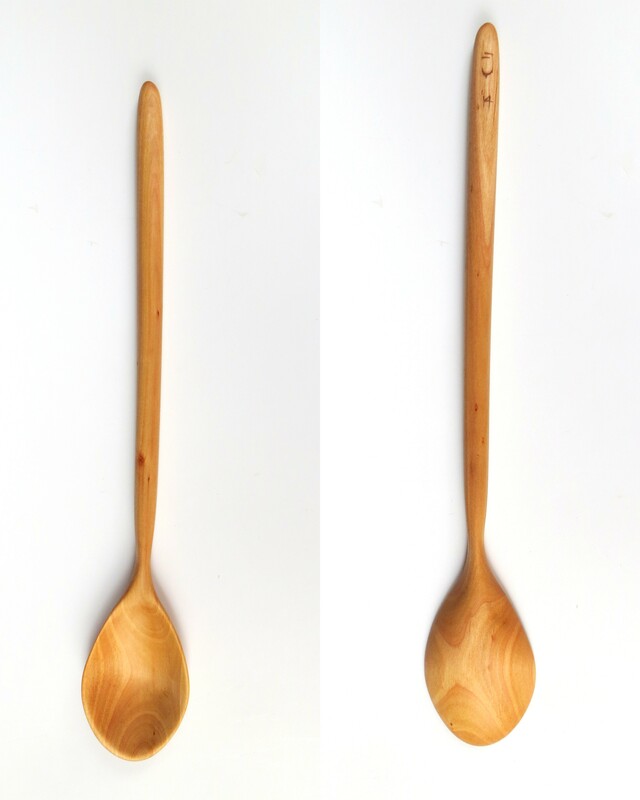 Cockspur hawthorn (crataegus crus-galli) spoon. 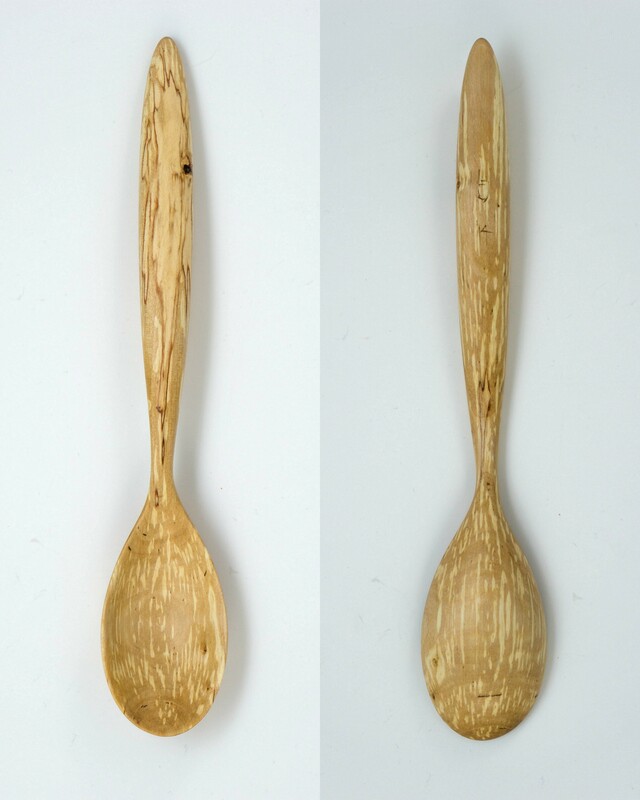 Has slight spalting, mainly in the handle. 16 cm long. 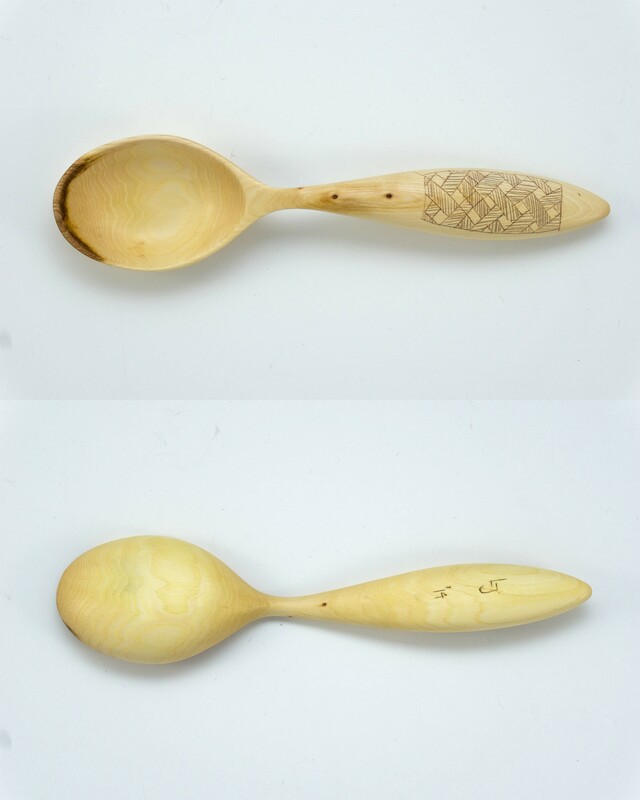 This entry was posted by Lieuwe in Green woodworking. 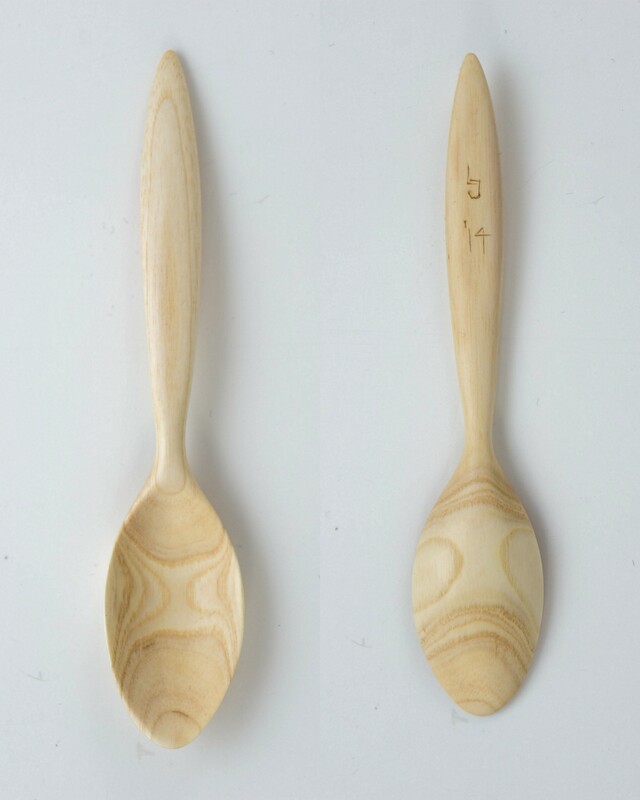 Had your spoons for breakfast this morning with a bagel and coffee. They were delicious, inspirational, exquisite.